One of the reasons why I travel is to experience a different culture. The difference in ways, customs of other people makes travel more exciting and fulfilling. That’s why in choosing my destinations, I always consider the cultural significance that I can experience in that place. Last October 2012, I decided to embark on a solo travel to Myanmar. Myanmar, formerly known as Burma is one of the more mysterious countries in Southeast Asia due to its seclusion from the outside world because of political reasons. It was ruled by a military government until 2011. And because of that, most of their cultures were preserved. It’s not westernized just like other Southeast Asian countries. I departed Bangkok via Don Muang Airport and flew to its former capital Yangon. I was so excited as I heard various stories before and read some books about Myanmar. I was expecting an awesome experience. The flight took an hour. And as the pilot announces our landing, I braced myself for an experience of awesomeness. I can’t hardly wait to step on its street and experience a country secluded from the outside world for almost 50 years. As I walked on Yangon International Airport, I noticed a distinct difference in culture immediately. Almost all locals, including the ones working in the airport are wearing longyi, their traditional clothing. It is cloth sewn in to cylindrical shape and worn around the waist running to the feet. Both sexes have its version. And for the men, it looks like they are wearing a skirt. In most countries, it is now uncommon these days to see their locals wearing their traditional clothes every day. But here in Myanmar-above all in Yangon-its biggest city, people are still wearing their traditional clothing. That alone made my day. I immediately took out my camera and was trigger-happy again. I went straight to my hotel, thanks to its free airport pickup. As we traveled for 40 minutes going to my hotel, I observed that most vehicles in Yangon-its biggest city-are mostly old models. Is it because of the military regime that secluded this country for almost 50 years? I roamed the streets of Yangon that day just observing and sightseeing. I talked to the locals and tried some of their street foods. One of my favorites is khauk swe thoke, a fried noodle with a similar taste to Indonesia’s mi goreng. It was so good that ended up ordering three platefuls. Myanmar’s feel is like a combination of Southeast Asia, China, and India. The people are varied. I saw a lot of Indian-looking men, Malays, and some Chinese. Betel chewing is a national pastime in Myanmar. In the Philippines, we also have that, but the people who are doing it are the indigenous tribes living in the mountains. But here, most of the people are doing it. Even in its former capital and largest city. What an amazing and preserved culture. That night, I visited one of Asia’s most amazing and most wonderful religious infrastructures, the Shwedagon Pagoda. A towering pagoda with a height of 110 meters and is made of real gold. The Shwedagon is so special especially among Buddhists because it enshrines strands of Buddha's hair. And apart from the real gold plates that envelop it-4,531 diamonds are encrusted on the top of the stupa-and the largest is 72-carat diamond. It was built 2,500 years ago. It is actually my childhood dream to see Shwedagon as I saw it in books and magazines before. So by beholding it right there in the heart of Yangon, it was a dream come true. Many locals and some tourist were there. Most of the locals were praying and doing some rituals. We wandered around the premises of the Shwedagon barefooted as foot wears are not allowed. The next day, I went out of the city and headed to the countryside or the province if you will. I took an overnight bus and headed to Bagan, the land of a thousand temples. It is an ancient city located in Mandalay region. The overnight bus took 11 hours. I departed at 5pm and arrived in Nyaung U at 4pm. Nyaung U is the town where guesthouses and shops are located. It is 4km from old Bagan. At the bus terminal, I was greeted by horse cart drivers offering a ride to the guesthouses or straight to the temples and witness the sunrise. I took one, and we headed to guesthouses for check-in-after which, I decided to go straight to the temples since I had enough sleep in the bus. What a wonderful feeling it is to be in a horse cart roaming the ancient city at 4:30am. We went to Mingalazedi Pagoda, one of the bigger temples in Bagan and waited for the sunrise. There were quite a number of tourists but it is few compared to the sunrise fanatics in Angkor Wat. The sunrise was so beautiful. As the sun slowly rose, you can behold the thousand temples scattered everywhere. And the morning mist makes it more dramatic. Walking on that ancient city help me appreciate more history and its cultural significance. The rest of the days in Bagan were spent mingling with the locals and going from temple to temple. Since it is not touristy, you can have the temples all by yourself. After a few days in laid-back Bagan, I went again to Yangon for my return flight. But before the flight, I had a day-so I spent it exploring the rich culture in that place. I behold Sule Paya, another pagoda made of real gold, ate local foods, and witnessed girl monks in pink robes. My experience in Myanmar is really fulfilling and memorable. There were lots of new discoveries and I was able to understand, appreciate and realize more that we live in a world of different cultures. Myanmar, the golden land, so they say is a country rich in culture. It’ll be one of your most amazing travel and cultural experiences. Visit Myanmar before it completely changes. Getting there: AirAsia have direct flights from Bangkok and Kuala Lumpur to Yangon. Accommodation in Yangon: Ocean Pearl Inn. $20/night with AC, cable TV, hot shower and breakfast. Free pick-up from the airport. Accommodation in Nyaung U, Bagan: New Wave Guesthouse. 10,000 kyat ($11.66) with AC and breakfast. What are you looking for in your travels? Thank you pre. Tirahin lang. 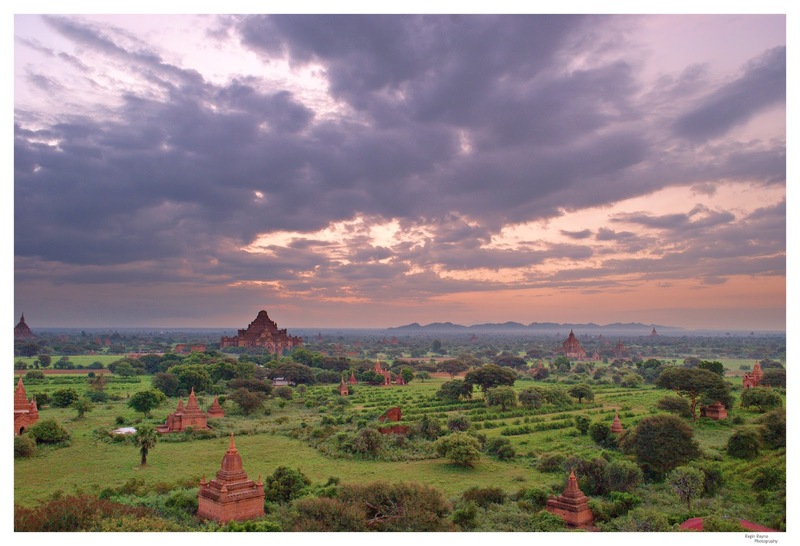 Your photo on your solitary moment in Bagan is very nice! And the food shot also, it makes me hungry! Thanks Missy. I hope you'll visit Myanmar too. It is indeed a charming country. Is New Wave Guesthouse a decent place to stay? Yes, it is. It's very basic, though.